Les Violons de Bruxelles are performing in Thrill: Jazz From Brussels, which takes place in Edinburgh in February. Edinburgh Jazz & Blues Festival is renowned for featuring extraordinary musicians on the basis of their outstanding performances rather than their name recognition in Scotland. As they surveyed the jazz world, the festival organisers were amazed by the quality of some European jazz scenes, and are thrilled to offer a very special snapshot of one of the most exciting places for jazz in 2019: Brussels. Belgium has played a key role in jazz history. The iconic jazz instrument, the saxophone, was the Belgian, Adolphe Sax’s invention; and Django Reinhardt, the Belgian guitarist, was the first non-American to be a major international jazz star and to almost singlehandedly create a European jazz style – gypsy swing – that endures to this day. There have been many Brussels jazz greats, from Phillip Catherine to Toots Thielemans, but nothing to match the current crop of brilliant musicians. From Thursday, February 7, to Saturday, February 9, Thrill presents 11 concerts that highlight the best of the new Brussels jazz scene in some iconic Edinburgh venues: The Queen’s Hall, The Jazz Bar, St Brides Centre and on the High Street. Thrill kicks off with a celebration of the music made famous by the Belgian gypsy guitarist Django Reinhardt with a thrilling five-star international Gypsy Swing double bill featuring Les Violons de Bruxelles plus Rose Room. Led by violin superstar Tcha Limberger, Les Violons de Bruxelles are an all-string swing orchestra playing gypsy music with virtuosity, verve and panache. Fronted by Seonaid Aitken, Rose Room, re-create the excitement of Rive Gauche Paris of where Reinhardt and Stephane Grappelli set alight the jazz clubs of the 30s and 40s. The programme at St Brides also includes double headers, with Strata and Antoine Pierre Urbex, two young bands at the forefront of the new jazz scenes in Belgium and Scotland. On Saturday saxophonist Toine Thys Trio, featuring guest guitarist Hervé Samb, are paired with the leading Scottish group, Colin Steele Quintet; and then later on Brussels jazz legends Aka Moon feature opposite Laura MacDonald’s History of Sax. 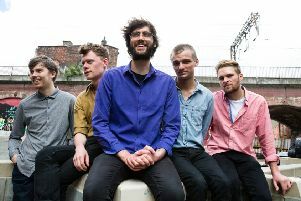 The Jazz Bar programme kicks off with a Scottish/Belgian Sextet featuring three musicians from each country – the Thrill Sextet play in double bill followed by Mâäk quintet. Piano jazz features with Oriental Jazz Project and Martin Salemi Trio, Esinam, delivers hypnotic, dance-floor beats with a spiritual jazz feel. Brandhaard and Echoes of Zoo deliver exciting contemporary jazz, one with a New York feel, one with eclectic influences. The High Street is the setting for an extraordinary outdoor performance on Saturday, February 9. Thrill the City features steaming gnaoua drums, Moroccan percussionists and red-hot saxophones will create a carnival of rhythms. The three performances are free and last 20 minutes. Thrill was inspired by Rachid Madrane, Minister of Promotion of Brussels at the Wallonia-Brussels Federation, who said: “In recent years, more and more jazz bands are emerging in Brussels. “A thriving scene made up of young talents such as Antoine Pierre, Jean-Paul Estiévenart, Melanie De Biasio and Esinam Dogbatse, illustrate the creativity and mix of Brussels. The programme has been delivered by Visit Brussels and Les Lundis D’Hortense, Met-X, Flagey, Brosella, Bozar, Jazzstation and Marni. Roger Spence, co-producer of Edinburgh Jazz & Blues Festival, said: “Packed with UK debuts, one-off performances and exclusively curated concerts, we are delighted to present this insight into Jazz from Brussels. “The raft of performers features includes an array of powerhouse bands and the brightest emerging talent. Tickets are available online at www.thrill.brussels and via Hub Tickets on 0131 473 2000.